Rising costs may force parts of the Capital Crescent Trail onto local streets, but it could actually give pedestrians and bicyclists a better experience. Ever since the Purple Line was first envisioned as a trolley between Bethesda and Silver Spring in 1986, plans have included a bike and pedestrian trail next to the tracks, giving people an alternative to negotiating busy streets. Today, the Capital Crescent Trail is a popular amenity. 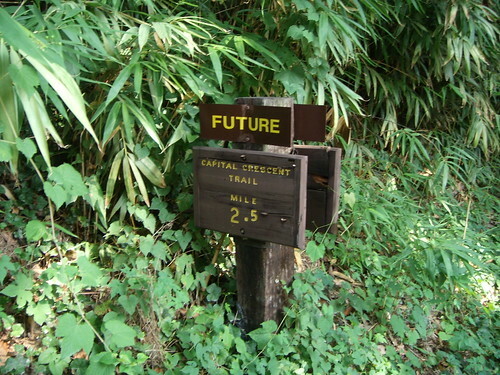 A survey done in 2006 counted 23,000 people using the trail at one point in downtown Bethesda. Meanwhile, the Maryland Transit Administration says rebuilding the Capital Crescent Trail next to the Purple Line could cost as much as $103 million, $40 million of which would go to building a raised platform for the trail in a tunnel beneath Wisconsin Avenue in Bethesda. That's why Montgomery County planners are looking at placing the trail above ground, as Matt Johnson wrote about yesterday. 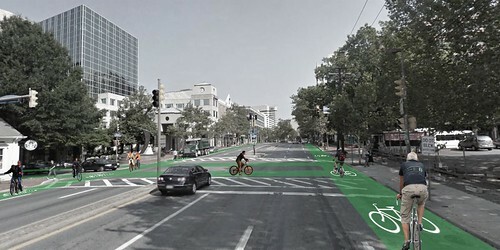 Not only is this option cheaper, but it'll be better for users and for neighborhoods. 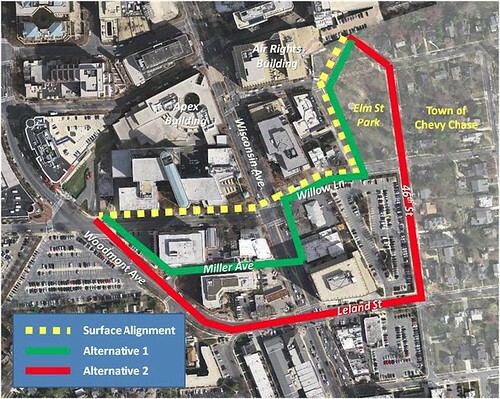 Alternatives for an on-street route through downtown Bethesda. 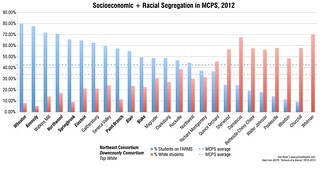 Image courtesy of the Montgomery County Planning Department. Supporters of separated tunnels and bridges over busy streets say it makes pedestrians (and occasionally bicyclists) safer by keeping them away from heavy car traffic. But they can also isolate users from their surroundings, encouraging criminal activity. Both the Forest Glen pedestrian bridge and the Metropolitan Branch Trail, which sit above the street level, have had problems with attacks and muggings. At the same time, taking pedestrians and bicyclists from the street only reinforces the thinking that they don't belong there. "I think [Montgomery] County doesn't seriously take biking as a form of transportation," said Peter Wolf of the Coalition for the Capital Crescent Trail when I interviewed himin 2007. "For me to be seen biking to work or biking in my neighborhood, it's seen as a little . . . odd." The 15th Street cycle track. Putting more pedestrians and bicyclists on the street in Bethesda shows that they have a right to use that space and makes those activities seem "normal." Building wider sidewalks or a parallel path like the Silver Spring Green Trail provides ample room for pedestrians walking for transportation or recreation. 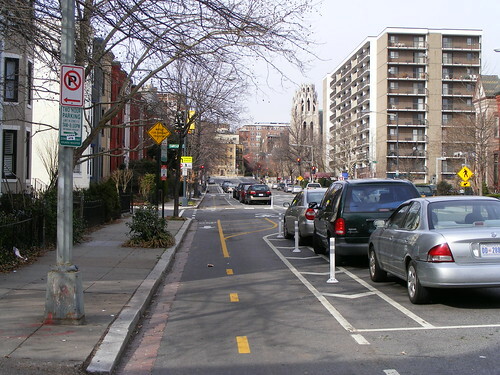 Cycle tracks, like the one that currently exists along 15th Street in the District, give bicyclists a protected route away from car traffic similar to what they'd have on the Capital Crescent Trail. This would give users the protection the Capital Crescent Trail currently provides while allowing them to see their surroundings and be seen, making them feel safer. Not only that, but an on-street trail would provide direct access to homes, shops, and places of work in downtown Bethesda. The existing tunnel only has entrances at Woodmont Avenue and Elm Street, meaning that anyone going to places in between already has to use surface streets. These changes may require taking out car lanes or removing on-street parking, as county planners recommend, which might increase congestion. But it will also help to slow car traffic in Bethesda, an area where drivers shouldn't be allowed to speed through anyway, while providing safe, attractive alternatives to driving for short-distance trips. 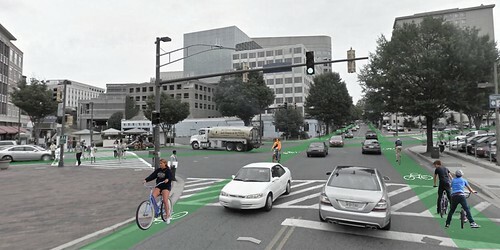 That could help reduce car traffic, in turn making it even safer for people to walk and bike around downtown Bethesda. What a trail network might look like at the intersection of Bethesda and Woodmont avenues. What a trail network might look like on Wisconsin Avenue. Placing the Capital Crescent Trail on local streets in downtown Bethesda to accommodate the Purple Line doesn't have to be an inconvenience for trail users. In fact, it could make Bethesda a better and safer place to live and visit. It also helps conserve money for other portions of the trail, which currently dead-ends 1.5 miles short of its intended terminus in downtown Silver Spring. As trail advocate and contributor Wayne Phyillaier points out, eliminating the Bethesda tunnel may be the only way to finish the trail. Developing a network of off-street trails is a great way to tie our region together, and finishing the Capital Crescent Trail is an important part of it. But it's also important to provide links to neighborhood and activity centers, and the best way to do that is on surface streets. Running the trail through downtown Bethesda instead of under it lets us build that regional network while also giving local communities the option to bike or walk. Very thought-provoking article. I'm glad you mentioned the safety aspect. As someone who was involved in efforts to improve the safety of the Forest Glen Pedestrian Bridge AFTER the muggings I believe it is very important for the county and state to plan for the security on the trail and on access paths to the Purple Line stations. I've used the trail tunnel under Wisconsin Avenue. I've also crossed Wisconsin Avenue on the surface. Maintaining the tunnel for the trail is absolutely essential, especially for bike riders. Removing the trail is a break of faith with trail users. Maybe the solution is to stop the Purple Line before Wisconsin Avenue. Of course, why are we worrying about this? Given the federal and state budgets, the Purple Line is far from a done deal until there is actually money for construction. Removing the trail is a break of faith with trail users. Of course, so would not building the trail out to downtown Silver Spring. Or not building the Purple Line, which was a promise the County made before the Capital Crescent Trail was even built. We're going to have to provide on-street bike and ped facilities (bike lanes, sidewalks, etc.) regardless of what we do with the trail. Making streets like Wisconsin Avenue (and Georgia, Connecticut, and so on) safer to cross is a must. On street bike lanes can never equate with a dedicated bike path through the tunnel with no need to stop for traffic on cross streets, etc. You can simply get on your bike and ride through the tunnel. No stops, no traffic, no problems. The experience is going to be very different if the bike lane is on the streets. Why not stop the Purple Line before the tunnel and have the patrons walk to their destination (they'd have to do that anyway) or the Metro station? Completing the trail and doing it above ground with separate bike lanes as on 15th Street or as on Pennsyvlania Avenue in DC would be preferable. Agree with the point made that it sends a message that bikes belong and it is much more convenient to able to hop off and stop in a store. I (try) to commute year around and the CCT doesn't feel that safe after dark, where riding on city streets after dark is fine with the right lights/reflectors. Ending the Purple Line before the tunnel would put it in the middle of Elm Street Park in Chevy Chase. Commuters wouldn't like that very much, but I'm sure the Town would have a lot to say about it as well. Bicyclists are going to have to go off-trail regardless. So what are we going to do? Let them speed through the tunnel and fend for themselves on the road once they get out? Or provide an on-street trail network that, while a little slower, gets people to their actual destination in one piece? The idea of ending the Purple Line east of the tunnel and having transit users walk came up during today's Planning Board hearing. The MTA has been asked to at least look at this some more. But I think the idea should die on the fairness issue alone. 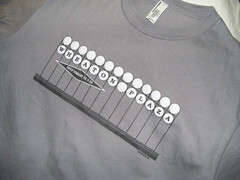 The Purple Line Bethesda station is estimated to have 11,500 boardings each week day. If you assume and equal number of people get off there, that would be 23,000 people using the station every day. Times five workdays in a week, and we have 115,000 transit users each week without counting weekends. The trail use has been counted and is 10,500 each week. So - there are more than 10 times as many transit uses as trail uses. Most transit riders will want to go to the Metro south entrance elevators to transfer, or to points west of Wisconsin Ave. For them there will be a walk of 1000' because the Purple Line stops short. For trail users, the alternative trail route on the surface will be about 400' longer than using the tunnel. And about 1/2 of the trail users are on bikes where 400' is no big deal. As a trail user, I just don't feel comfortable asking 10 transit users to walk 1000' so that I don't have to go an extra 400' and wait at one light to cross Wisconsin Ave.